The "Spek" report for those wondering with inquisitive thoughts is a new monthly or maybe weekly feature I'm introducing to this website. It entails a detail examination of any known device,hardware,computer that has peak my interest, so much that I break down and analyze every integral part of what makes this piece of technology so unique. We break in this new feature to this website by taking a close look at what I deem as the best desktop computer on the market,the MainGear Shift PC. To say that this particular high-end desktop PC is constructed mainly for gaming is a pure understatement ,many people who have the honor in purchasing the MainGear Shift don't use it for the sole purpose of just gaming even though its has the incredible hardware to run any graphic intense gaming title. Users are delegating heavy duty tasks that includes video editing and graphic design, and some are even using this machine for CGI animation. So for me interest in this desktop computer has me peaked,mainly because its being use for more than just gaming, and proof that you don't need a Apple base computer to be your primary workstation. I have written about many gaming machines in the past and listed their specs,but MainGear Shift PC is something special and unique. Lets take a close observation at the Shift hardware and look at its overall design. The first thing you notice about the MainGear Shift when starring at this machine you visually see the sharp edges right along with its compact design. Very elongated desktop computer yet at the same time its not compromise with overall bulkiness,something often seen in most high-end desktop computers that houses supreme hardware. Peaking inside the MainGear Shift,you'll notice two things,its superbly neat clean cable management. The cables is barely notice as they are grouped and neatly tied together. This type of cable management almost always will insure proper airflow for added cooling inside the case. Then there is the whole hardware setup inside its case. The entire motherboard is rotated 90 degrees, that means the motherboard,graphic cards memory,everything is turn sideways,the sole purpose of this is so that the machine can take in cool air from the bottom and the side and push hot air out through the top of the PC. 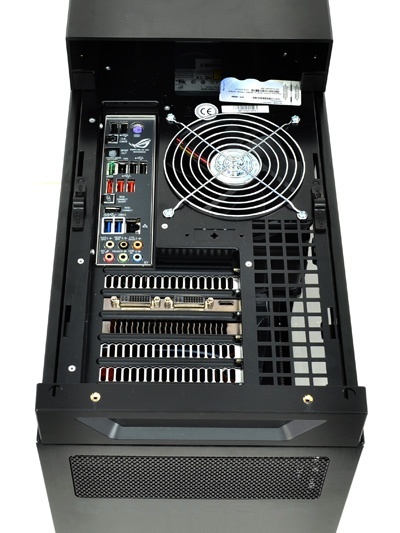 This insures cooling efficiency since hot air naturally rises to the top.This type of setup also places all of your ports right on the top of the PC. From what I gathered no manufacturer has this type of innovative setup within their desktop PC's. The MainGear Shift comes in different types of color scheme with red,white and matte black being the most popular choice for consumers. MainGear sprays if PC's with the same type of paint that's used on cars. You're getting that extra coated of protection from rust and age. The same type of spray painting technique is applied inside of the case. The hardware assembled in the MainGear Shift is summed up in just one word,BEAST. There is different variants of hardware option for consumers,for this article we'll go with high-end option. The MainGear Shift undoubtedly pose a strong rival with the Mac Pro,again its not wonder many are using this machine not just for gaming but as primary workstation. Now anyone can pretty much put together a computer with this type of hardware,but I seriously don't think anyone can put such innovative emphasis on the overall design.